Let’s face it those deep-calling cravings that make you rummage through the cupboards looking for unnecessary sweets are annoying. Sometimes they make you feel like someone else has taken over your body. You know what I’m talking about, that dreaded feeling that you are about to burst right out of your skin – from the inside out. Sometimes your skin crawls. Other times it feels like a demon in your tummy hiding in the dark, waiting, waiting, waiting, to pounce on a chocolate bar. It’s honestly enough to p**s you right off! There are lots of reasons why we crave sugar. Your job is to understand it and fix it. 1. When you don’t eat enough calories, your body starts looking for fuel fast as a way to catch up. Sugar gives you quick energy, even though it’s not necessarily a good energy. Usually, when you’re really hungry and you haven’t eaten enough throughout the day you crash and go for sugar or caffeine to pick yourself up. Don’t do it. Instead, eat small high protein, low sugar, low carb meals every 2-3 hours. That works. You won’t need a pick me up – you will feel stable and content all day. 2. Eating sugar as a pick me up is a bad habit which leads to the cycle of sugar ‘pick-me-ups’. Get out of that cycle. 3. When you eat heavy, starchy high carb food like pasta and no protein you are headed for a sugar crash. Carbs convert to sugar so all that pasta with no fibre or protein is essentially a bowl of sugar. One hour later you’ll be looking for more! It’s highly addictive. 4. High fat and high salt foods often result in food cravings. Think about the last time you went to a restaurant and had a great meal full of salt and fat. What’s the next thing that happened? Yes, you craved dessert. Substitute high fat, high salt for high fibre, high protein. That will fix it. A low carb, low sugar, high protein eating lifestyle is the healthy way to go. It switches the body’s fat storing process into a burning excess body fat process. Making it a way of life will improve foggy thinking, make you slimmer, more energetic and eliminate intense sugar cravings. Sugar withdrawal is intense. It feels like someone else has taken over your body and you’re out of control. It’s stressful and it can often lead to a cycle of craving, binging and then feeling guilty. We don’t want that cycle. We want a peaceful easy day that we control rather than sugary high carb foods controlling us. Eating low carb, low sugar, high protein makes you calmer and the body more stable! In that light, this series is dedicated to those with a sweet tooth sugar addiction who need a much better way to live and eat. Recipes in this series will provide the right foods that tap into your fat stores and are used as energy rather than storing fat. A balanced blood sugar level will feel right. Your body will feel calm. You won’t be searching for unnecessary carbs and sugars and you will overall, simply feel better. With all that said let’s look into foods and recipes that support low carb, low sugar, and high protein elements. Feel good about this time, after a meal you won’t be looking for sugar an hour later. Instead, you’ll keep those carbs low and keep those carb/sugar cravings away. Remember that after a high carb meal you will feel hungrier, craving and often agitated as the body seeks to feed the sugar addiction once again. Some people say that having a sugar addiction is the worst addiction of all. After all, you can’t just ‘stop’ eating like you can stop drinking booze or taking drugs. But you certainly can stop the sugar and carb crave cycle with the right recipes and the right plan. Reducing carbs and sugar and increasing protein ‘gives’ you sustained energy throughout the day. Reducing carbs and sugar provides a steadier blood sugar level and your body produces less insulin (the fat storage hormone). Reducing carbs and sugar and increasing protein, allows the body to remain calm and stable rather than be in an addictive sugar craving state. Higher protein provides the body with a fuller feeling for longer. Digestion takes longer and energy levels remain consistent. You feel fuelled and satiated. Pairing protein with carbohydrate-rich foods slows down the absorption of sugar from your stomach to your bloodstream, stabilizing blood sugar and eliminating cravings. When losing weight your body loses fat and muscle. It’s important to eat protein so that you don’t lose muscle but ‘do’ lose fat. Keep the exercise and muscle building exercises up at this time! Adequate protein coming in from food fuels fat burning while preserving lean muscle mass. Excessive protein is not the way to go either. Protein should be 20% of your daily calories. Protein promotes muscle repair and growth so eat protein when weight training. 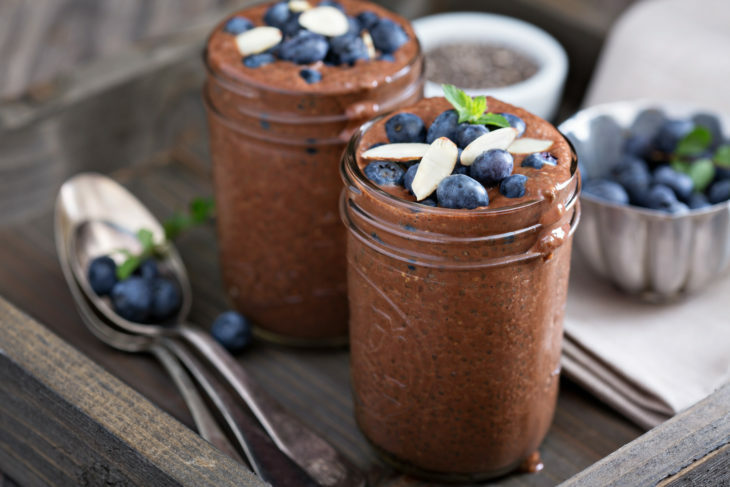 A high protein, low carb, low sugar shake is great right after a workout. When we eat carbs they are converted to glucose that stays in the bloodstream and can quickly convert to energy. So we often go for that quick pick me up by reaching for a high sugar boost. That’s not helpful. What’s going to give you long-term sustained energy is eating low sugar, low carb and high protein for a sustainable consistent energy level all day. 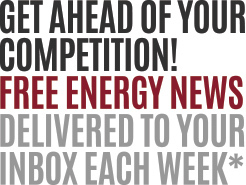 Want a boost of energy? Drop to the floor and do 20 push ups. You will feel energized after that! 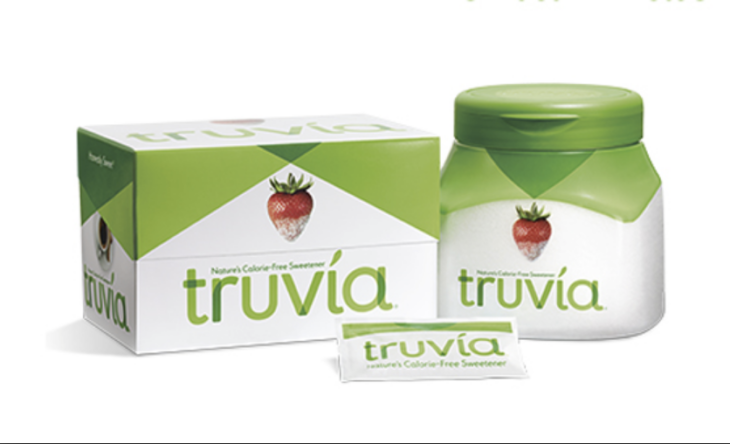 Switch out sugars for natural, organic, calorie-free sweeteners like stevia. Get used to eating without sugar. After 30 day’s of eating low carb, low sugar, that craving disappears altogether. Drink lots of water. Most often we think we are hungry when in fact we are thirsty. Drink 8 ozs of water. After 5 minutes, see if you still have the same craving. The mind is not your friend. In the midst of a craving divert your thoughts by brushing your teeth or doing a set of squats. Change your body position and it will change your thoughts and cravings. Use berries over tropical fruit. They have a lot less sugar. Blueberries, Raspberries, Strawberries and Blackberries are your friends! GREAT FOR CHOCOLATE CRAVINGS and COMFORT FOOD! Pour the almond milk, sweetener, vanilla, yoghurt and cocoa in a bowl and mix it together. Add chia seeds and stir them in well. After about 5 mins. give them another stir. Cover and refrigerate for at least 3 hours, overnight if you prefer. Garnish your pudding with additional fresh berries, a hint of cinnamon or any other flavoured pudding garnish you have around the house. Fresh mint is always nice. 1. This recipe can use yoghurt or not. It’s optional. 2. 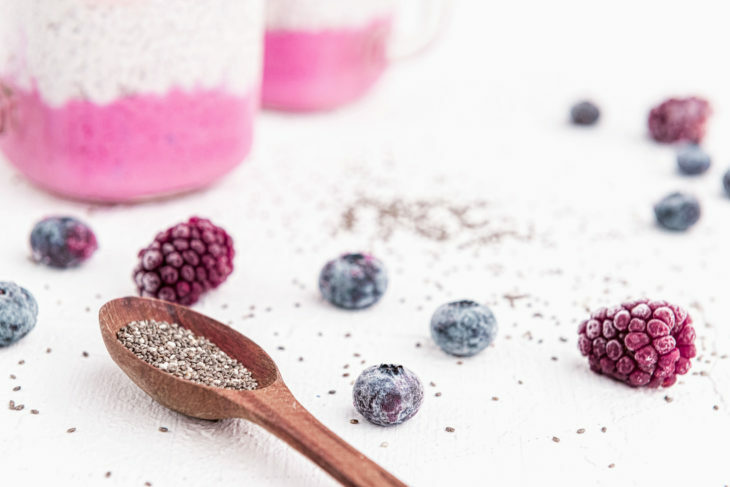 Chia seeds can be more or less. 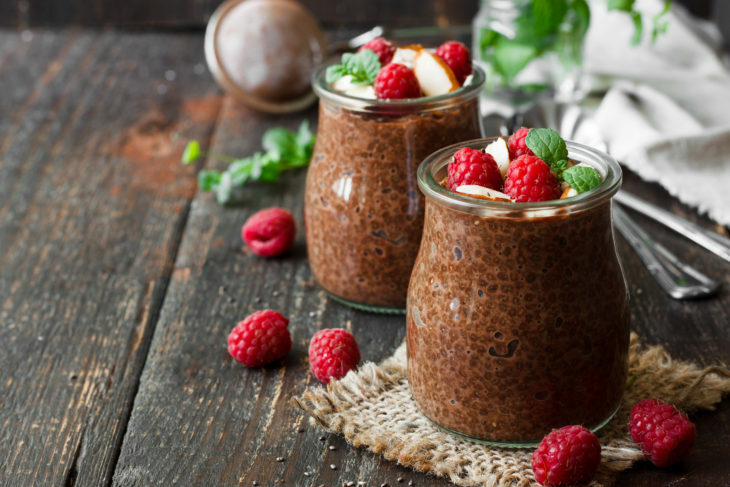 Try a few versions with more or less Chia and see what you like. 3. Sweetness is also up to your taste adding more or less stevia. Stevia can have an aftertaste in some cases, so I try to keep it on the lower side. Find that balance between too much and too little. 4. Rather than cocoa remove it and have more of a vanilla pudding or a caramel flavouring is also an option.